Mohd Nazifuddin Datuk Seri Mohd Najib, the youngest vice-president to be elected into the Olympic Council of Malaysia yesterday, is set to live up to legacy of his grandfather – the late Tun Abdul Razak Tun Hussein, the fourth president of the body. Abdul Razak was the OCM president from 1969 to 1976. The 32-year young entrepreneur who comes from a family with two prime ministers, was nominated for the elections by the Malaysian Taekwondo Association of which he is deputy president. “I thank the delegates for showing confidence and voting me in. It is now time for me to perform and assist OCM in moving forward to greater heights,” said Nazifuddin. “My grandfather was responsible for laying the foundation of OCM to become what it is today and I have a hard act to follow. Nazifuddin in his to minute address to the delegates was articulate and impressed the delegates with his aim and vision. 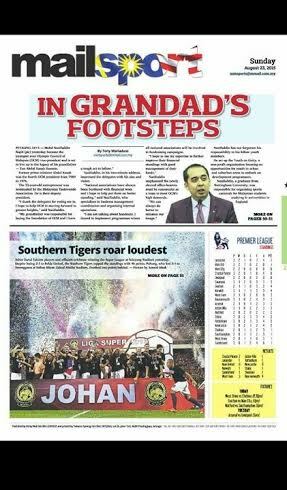 “National associations have always been burdened with financial woes and I hope to assist them to put them in better standings,” said Nazifuddin who specialise in business management coordination and organising internal operations. “But I am not talking about handouts. I intend to do programmes where all national associations are involved in a fund raising campaign. “It has to be a collective effort to help themselves. “At OCM I hope to use my expertise to further improve their financial standings with good management of their funds,” said Nazifuddin who entered the corporate scene at the age of 26. Nazifuddin emphasised that the newly elected officer bearers must be resourceful as a team to meet the high standing demands of OCM. As an aspiring young, Nazifuddin had not forgotten his responsibility for his fellow youth members. He set up the Youth on Unity (Y.O.U), a non-profit organisation to develop focus on opportunities for all youth in urban and suburban areas to embark on youth development programmes. Nazifuddin, a product the Nottingham University, was responsible for organising sports carnival for Malaysian students studying in various universities in England.